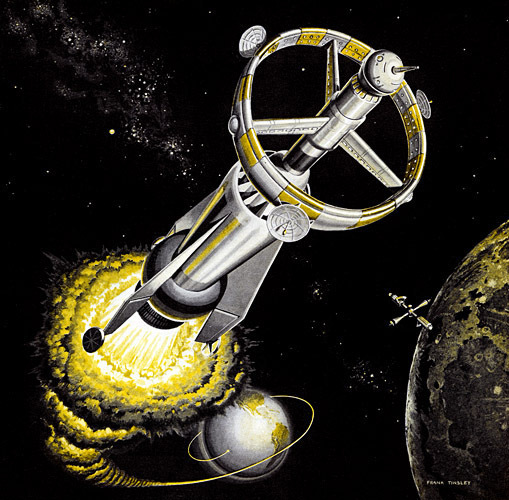 This is the Atomic Pulse Rocket, a pot-bellied spaceship nearly the size of the Empire State Building, propelled by a series of atomic blasts. The enormous rocket (weighing 75,000 tons fully loaded) is designed to leave Earth with a thrust of 100,000 tons. Altogether a thousand atomic blasts—each equal to 1,000 tons of TNT—are fired from a low velocity gun into a heavy steel rocket engine at a rate of one per second until the vehicle leaves Earth's atmosphere. Then steam and vaporized steel from the combustion chamber maintain the thrust. Inside the rocket, living quarters are situated in the rim of a pressurized wheel-like cabin which revolves to provide artificial gravity. Tubular hydroponic "gardens" along the rim produce oxygen and high-protein food.